View content at four times the resolution of 1080p with the Samsung Q80 55" Class HDR 4K UHD Smart QLED TV. This TV has a 54.6" Quantum Dot LED-backlit LCD panel, and incorporates Motion Rate 240 technology to digitally enhance fast-moving images to reduce blur. It is compatible with the HDR10, HDR10+, and HLG HDR formats to provide a wider color gamut with compatible content and other equipment for more vivid images. The Q80 has built-in Wi-Fi and Ethernet connectivity to provide access to your favorite apps and Internet-based content, plus content sharing and screen mirroring with your other smart devices such as your smartphone or tablet. With four HDMI inputs, there are multiple options for connecting high-definition video sources. Two USB ports are also onboard for connecting multimedia peripherals like flash drives. The Bixby virtual assistant is built-in, and the Q80 also supports voice control via the Google Assistant and Amazon Alexa. 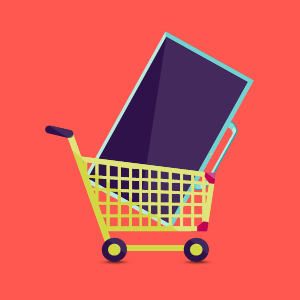 Note: Content acquired via certain apps may require subscription to a service. Voice functionality does not support all languages, accents, dialects, or expressions, and features may vary by language. Please see the manufacturer's website for more information. 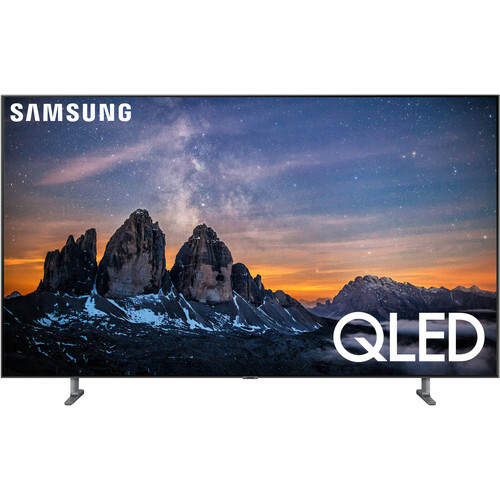 Box Dimensions (LxWxH) 55.0 x 33.0 x 7.0"
Q80 55" Class HDR 4K UHD Smart QLED TV is rated 4.2 out of 5 by 12. Rated 1 out of 5 by Ka01 from What were they thinking Received from Samsung today. DSE was bad, got panel AA01. Picture was only good watching Netflix. Regular HD viewing was just aweful. I played with all of the setting and all TV shows were fuzzy both newer shows and old. If you want just for movies it is okay. If you want to watch regular cable HD channels stay away. Boxed it back up within 1 hour. My un65ks9800 from 2016 makes this TV look like a 420p RCA. Very disappointing,only positive is viewing angles were very good. Rated 2 out of 5 by TV21 from Overall a great TV, but mine seems defective When I first turned on my 65" Q80R I was blown away by the color and picture quality. However it wasn't long before I noticed a black spots all along the edges of the TV, and one spot in particular is super dark and distracting. It's all I can see when I turn my TV on now. The picture attached doesn't do it justice. In person, you can easily notice black shadows all along the edges of the TV. Rated 2 out of 5 by WilliamA from Downgrade from 2018 QLED Coming from a 2018 Q8FN, the 2019 Q80R is quite the downgrade. It seems that we have received wide viewing angles but the trade off is going against what QLED previously achieved. Native Contrast has taken a big hit to below average, Color Gamut and Color Volume has been reduced, Local Dimming is less aggressive which is causing blooming unless putting mode to low, plus for some reason Local Dimming in Game Mode has a totally different algorithm that suffers from grey blacks and much more blooming. In 2018, the Q8FN was very hard to beat with what I mentioned above. Samsung needs to bring back the local dimming algorithm from the 1202 firmware update to 2019 QLEDs. I feel many would prefer a little loss if dark detail which only occasionally happened on my 2018 Q8FN over what has been implemented with this 2019 Q80R. The Q8FN was a very hard to beat TV and the Q80R should have stuck with its strengths of local dimming and deep blacks. As for the contrast and color downgrades...if it is indeed the wide angle tech that is the reason for this trade off, I feel Samsung should have been honest so people can properly choose which is more important : viewing angles or color and contrast. If color and contrast is some people’s pick over viewing angles, they would clearing pick the Q70R as it won’t have that trade off due to no viewing angles. I wouldn’t have upgraded from my amazing Q8FN which did suffer uniformity issues but would have chosen repair versus paying an upgrade fee for a downgraded Q80R. 2019 QLEDs should have been everything 2018 was, with the improvements. People need to know Samsung! 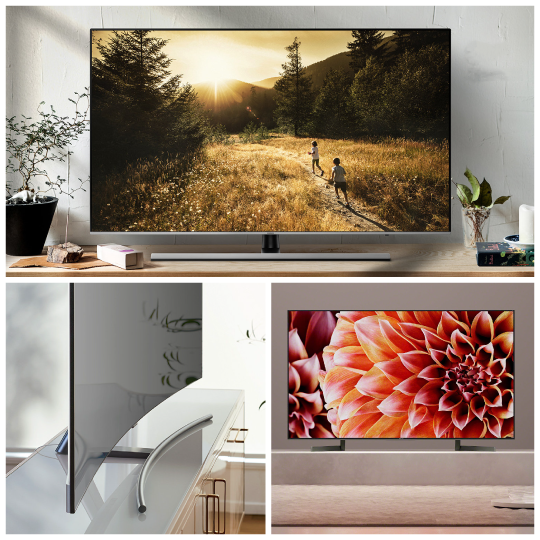 Rated 5 out of 5 by maher203 from Great Overall TV The Samsung QLED Q80R is an absolute dream-come-true of a TV. I have been using it daily for a week now and could not be more happy. The unboxing process was extremely simple and straightforward thanks to the clever design of the packaging. The box just easily lifts up leaving the TV exposed for an easy unboxing process. The set itself is very well made and the Stans seems to be very sturdy. Setting up the TV took no more than 5 minutes which allowed me to focus on what the TV is actually made for: an excellent viewing experience. The TV has an option for set-up using a mobile app which made the initial configuration an absolute breeze. The TV itself also has an auto-calibration mode which takes a lot of the guesswork out of the picture settings, and allows it to dynamically change as the lighting in the room changes. This is extremely handy in my living room as I live in a location with abundant sunshine during the day so not having to manually adjust the brightness is an appreciated feature. The stunning backlight of the QLED 80R is more than enough to handle even the most well-lit rooms which is a must for a TV in my living room. Even at night, while not able to produce the true blacks of an OLED panel, the Full Array feature allows local dimming to provide a more-than-satisfactory experience while watching dark scenes, even while viewing at night. The sound quality seems to be similar to other TVs in the same tier with decent bass for scenes involving explosions and other deep sounds. While browsing the menu features, I noticed there is a mode that allows a Samsung rep to remotely login to your screen to provide better customer service (with your permission of course). Hopefully I never have to use this feature, but I can imagine it will be extremely helpful if I ever need to utilize it. Finally the Ambient Mode of the TV is a welcome feature in the era of wall-mounted TVs as it allows the device to transform into an art piece when not being used for video viewing. Overall, I am extremely happy with the QLED Q80R. It is my first QLED product and probably not my last. The set is beautifully designed, the image is stunning (no matter the amount of ambient lighting), the audio is more than satisfactory, and the remote/interface are intuitive and easy-to- use. Rated 5 out of 5 by NetflixAllDay from Wonderful Experience! This was my first experience with a Samsung QLED TV and overall a great one. The Samsung QLED Q80R had no issue transporting up to my apartment, it is not overtly heavy and easy for two people to transport. The unboxing process was overall easy as well. Setting up the TV was a quick process and we were ready for our viewing experience! The look of the TV is sleek and stunning. It is very sturdy but thin. The picture quality is impressive and is not affected by how much sunlight is in the room. We were able to view programs at various times during the day and the picture quality did not change with day vs night. We appreciated the auto-calibration mode which adjusted for the lighting in the room and was a big winner for us. Sound quality is great as well, there was no issue with this (I generally like to watch with subtitles on so I don’t miss key things but I didn’t have to with this!). The remote is easy to use which is great for when we have friends and family over. Overall, we were impressed with the Samsung QLED TV and can’t wait to share the experience with others! Does this TV feature HDMI 2.1? This model have one connect?